xMCT Energy is pure MCT oil, and is one of the fastest sources of clean fuel for body and brain, with fewer metabolic steps to convert into caloric energy than carbohydrates. 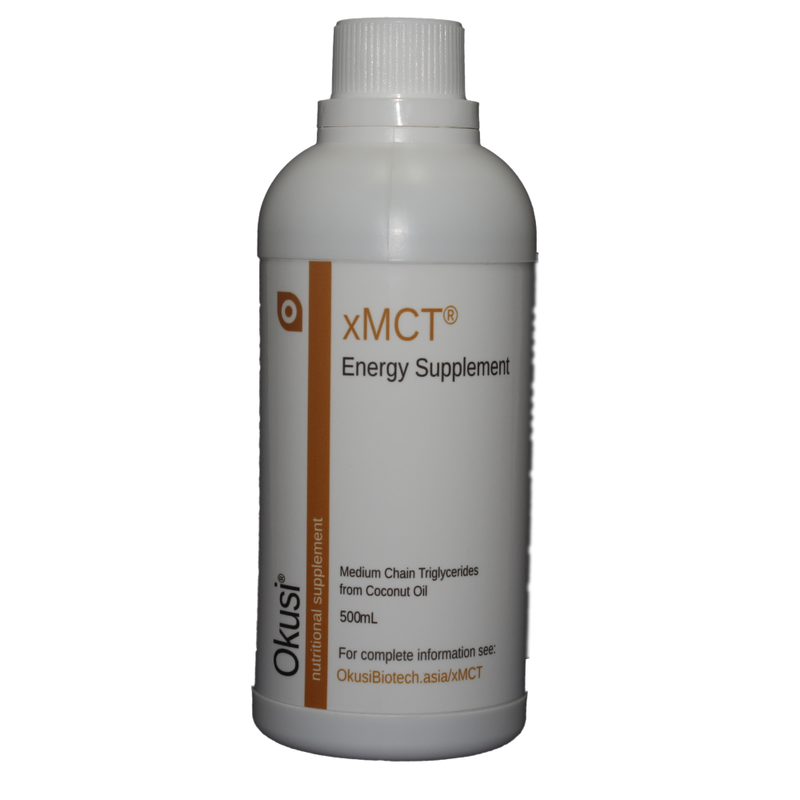 MCT oil from Okusi Biotech should be a vital part of your everyday diet. Reduces your appetite for sugars and carbohydrates. Absorb fat-soluble nutrients from various foods. MCT oil is a vital necessity for people on ketogenic or high fat-low carb diets. MCT oil is quickly digested and metabolised. xMCT oil is recommended for daily use in drinks such as butter coffee ("bulletproof coffee", or Kopi Lemak) and butter chocolate (Koko Lemak), and added to foods such as salads and green shakes. xMCT is a medical grade food product. xMCT is a combination of C-8 and C-10 Medium Chain Triglycerides (MCT). MCT oil is basically coconut oil minus the lauric acid (C-12) component which normally comprises over half the volume of coconut oil. KetoNutrition: Good theoretical resource, focussed on oncology. The Ketogenic Diet: Lyle-McDonald. PDF. A little bit dated but the principles still the same. What is intermittent fasting? : Kris Gunnars, BSc. "Explained in Human Terms"
If you are new to xMCT, or have not used it for a few weeks, it is strongly recommended that you build up your daily tolerance slowly. Start at half a tablespoon per day for 7 days, then gradually work your way up. Three tablespoons per day is an ideal to level out at. Each person is different, however, and you will need to experiment to find the daily amount you are most comfortable with.